The Norwegian Petroleum Directorate (NPD) has granted Lundin Norway AS a drilling permit for a wildcat well in the North Sea. The NPD said on Tuesday that the wildcat well, designated 16/1-31 S, would be drilled from the Leiv Eiriksson drilling rig after concluding the drilling of wildcat well 7121/1-2 S in the Barents Sea. The well will be drilled about 4 kilometers northeast of the Edvard Grieg facility in the central North Sea using the Ocean Rig Leiv Eiriksson semisubmersible drilling rig after it completes the drilling of wildcat well 7121/1-2 S on the Pointer-Setter prospect in PL 767 in the Barents Sea. 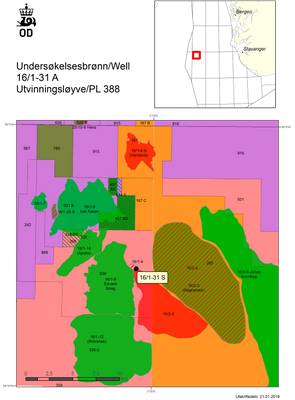 The area in this licence consists of a part of block 16/1. The well will be drilled about four kilometers northeast of the Edvard Grieg facility in the central part of the North Sea. Production licence 338 was awarded on December 17, 2004 (APA 2004). This is the 11th exploration well to be drilled in the current licence, but wildcat wells have previously been drilled within the licence area.